Is Alexa finally going to bring prefab into the 21st century? With news that Amazon has invested in the US modular housing market through the Amazon Alexa Fund, could we be finally approaching the tipping point towards offsite manufacture (OSM) being accepted as a viable alternative to traditional housing? If you ask Alexa, she'll say yes. The UK's housing shortage is well-documented, but nobody seems to be able to agree on who, or what, is to blame: planners; councils; the Government; major house-builders; even Brexit. Prefabricated house technology is not new, but it has been too small scale and relatively unknown to be seen as a genuine alternative to bricks and mortar and has felt like an outsider for some time. It has also, arguably, suffered from a reputation won in decades past. However, with space at a premium in our major cities, viable developments and schemes that provide genuinely affordable housing are too few and far between. There are signs that Parliament at least is starting to take OSM more seriously. A recent House of Lords report, covered more extensively in Property Week (Property Week - Offsite Manufacturing) suggests that, while prefab is not the housing shortage panacea (and one questions whether sufficient resources, in particular financiers willing to support an OSM development, are available for prospective developers), there is a definite tailwind beginning to blow away some of the foul humours currently clouding the market. There are already big names in the industry delivering homes using the OSM model - Legal & General are looking to build up to 3,000 modular homes a year for example. However, is a link with Amazon Alexa and a 'smart homes' image enough for millennials to overlook the slightly jaundiced view of 'prefab' held by older generations? Amazon's chosen investment, Plant Prefab, estimates that offsite housing can be constructed for as little as £100 per square foot for a simple flat (or £153 for houses) and with far less uncertainty surrounding the build and costs; Plant Prefab believes it could save between 10 - 25% in major US cities and do so in a far more environmentally friendly way which, given global initiatives being debated now, is vital to our future. Amazon's entrance does not remove the other hurdles faced by the housing crisis or indeed OSM: land prices in London are still too high; planning permission still takes too long; there are concerns over capacity, tolerances and acceptance of funders and warranty providers. But if you ask Alexa, she might tell you that with a bit of momentum and support from the right people, housing may start to become affordable once again. 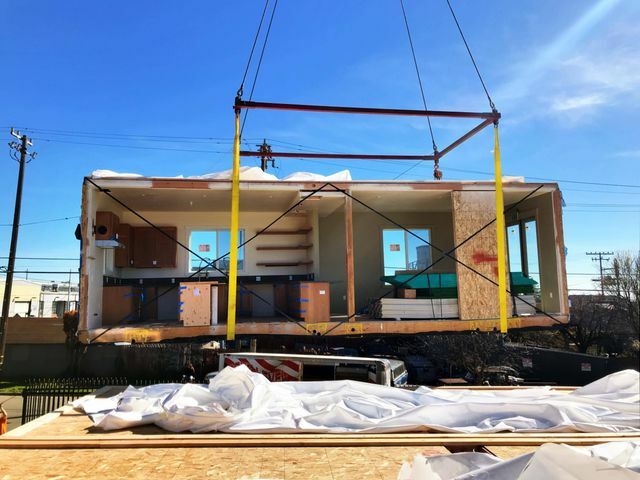 Cheaper and quicker to build than traditional housing, modular homes are billed as a way of combating the housing shortage. And, with smart technology taking over ever more aspects of our lives, it seems Amazon is keen to ensure the homes of the future are fully-compatible with the latest Alexa capabilities. There’s been a lot of talk of offsite recently. But is this sufficient to cope with the skills crisis on site? Have they cracked the Telecommunications Code? Dynasties: are shopping centres an endangered species?